It may now be necessary to explain shortly in what manner the Fathers conducted their missions and the state of their property and finances down to the decline of their prosperity and ultimate fall. Their mode of conversion, if not very ingenious, was easy enough. It was like the teaching of a monkey, or a dog, by means of food and caresses, or sometimes by kicks, to perform a few simple tricks. The Indian-like the hare in Meg Dodds', or it may be Mrs. Glass's Cookery Book, being first caught, was dressed in the following fashion, as described by Captain Beechy, in his second voyage: " I happened to visit the mission about this time and saw these unfortunate beings under tuition. They were clothed in blankets, and arrayed in a row before a blind Indian who understands dialect, and was assisted by an alcalde to keep order. Their tutor began by desiring them to kneel, informing them that he was going to teach them the names of the persons composing the Trinity, and that they were to repeat what he dictated. The neophytes being thus, the speaker began: "Santissima Trinidad, Dios, Jesu Christo, Espiritu Santo," pausing between each name to listen if the simple Indians, who had never spoken a Spanish word before, pronounced it correctly, or any thing near the mark. After they had repeated these names satisfactorily, their blind tutor, after a pause, added, "Santos"--and recapitulated the names of a great many saints, which finished the morning's tuition." The pay and inducement to the Indians to submit to what would doubtless appear even to them a farrago of nonsense, were a daily allowance of Atole and Pozzoli, which were two kinds of pottages, the first composed of barley flour and the second of the same, varied by the addition of peas, beans and maize. The former was the usual breakfast and supper dish, the latter was chiefly taken for dinner. Then huts, of which the Fathers kept the keys, were provided for the nightly lodgings of the faithful; while a simple kind of clothing was furnished to them at intervals. Soldiers took care meanwhile that order, decency and obedience were strictly observed at work and play, at devotion and rest. In return for these benefits, the Indians rose early, and attended mass every morning, for an hour and during the day, in the intervals between a second mass and meals and pretty constant prayers, cultivated the gardens and fields of the missions, gathered, preserved and arranged for sale the farm produce, herded and attended to the wants of their cattle, built their houses, spun, wove and cooked, and in all respects drudged patiently, though they do not appear to have taken the work very laboriously, as the born slaves of the Fathers, whose absolute will was all that they could comprehend or obey. With the instinct of a dog, they fawned on and loved their owners and perhaps would have readily died to do them service. How different all this from the free, intelligent and bold spirit of the present community! To sharpen the intellects of the converts, sticks, whips, long goads and the like were unhesitatingly employed by the beadles of the churches, during mass and prayers, to silence the unruly and make the refractory attentive and dutiful. Starvation and stripes indeed attended the perverse Indian wherever he went; and it was his interest--he could be made to understand that at all events--to comply with the wishes of his kind priestly persecutors as far as his animal nature would permit. The conversion produced by such means could scarcely be intellectual or very sincere. It seemed sufficient, however, that the Indian duly attended mass (which he was obliged to do under penalty of a sound, edifying whipping), knelt and muttered his incomprehensible Spanish words, made the sign of the cross often and properly enough, and could correctly repeat to his spiritual tutors, when called upon, the few cabalistic phrases which they had taught him. Whether he understood the meaning of these things was quite another question, as to which it was not necessary for the Fathers to be impertinently curious. What were these brown things, after all, but beasts--irrational beings, who might have a soul truly to be saved, but whom it was absurd to consider as having a mind! Individually, the Fathers seem to have been pious and philanthropic men; but certainly humanity, and California, owe them nothing. Everything, even happiness, is comparative; and to the mind, undarkened by the gloomy theology which considers the formal act of baptism without the understanding soul to be sufficient for salvation, it must surely be evident that the aboriginal savage, "lord of all he surveyed," was a more dignified and happy creature than the sleek, lazy, stall-fed beast of burden into which the Fathers had entrapped, or converted him. In the churches, which were, of course, the leading and most substantial buildings of the country, the walls were hung, with glaringly painted pictures--the more gaudy, the more valuable and effectual--of the saints, and especially of heaven and hell, to astonish and fix the faith of the converts. La Prouse observes that a horrible representation of hell in the church of San Carlos has thus had a wonderful effect in promoting conversion; while he considers that the picture of paradise in the same church, by reason of its subdued coloring and treatment, had comparatively little effect. In 1775, when Father Garzes was travelling, on a crusading or proselyting expedition from Sonoma to California, he carried with him a painted banner, on one side of which was represented the Blessed Virgin Mary, and on the other the devil in the flames of hell. On arriving at an Indian settlement, the missionary took his first step of conversion. Just as the travelling mountebank blows his horn and flutters his flag, on approaching a village of likely gulls, so did our good Father hoist his standard, and cry aloud; when, as he naively observes, the fascinated Indians, on seeing the Virgin, usually exclaimed, good!--but when they observed the devil, they as often said, bad! Probably this was faith enough to entitle them to immediate baptism, absolution and salvation. Food, lodging and raiment, and freedom from the cares of family and the future, naturally followed. By such means the Fathers speedily converted the whole Indian tribes within their reach; while, year by year, as the missions, and their servants and cattle increased in number, they took possession of the most fertile and desirable lands in the country. Much judgment and discretion were exhibited, as well in selecting the localities of the missions, as in subsequently managing them for a time to the best possible advantage. The means adopted for converting, training and employing the natives were admirably devised, and were more successful and satisfactory than could have been anticipated. 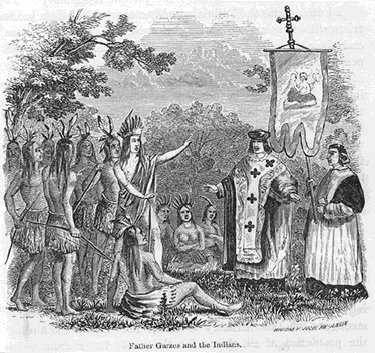 The fathers eagerly desired to make Indian converts; for every convert, besides becoming a partaker of immortal glory, was a valuable slave; but they dreaded and never invited the approach of free white settlers.